Guns N' Roses have enough new material for three albums. 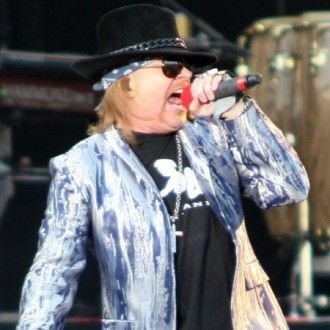 Frontman Axl Rose has penned tons of "great" new songs for the 'Welcome to the Jungle' rockers - whose 2008 LP 'Chinese Democracy' was their first record for 15 years - to work on in the recording studio, says his bandmate DJ Ashba. The guitarist told Triple M Melbourne's Hot Breakfast radio show: "Axl has a lot of great songs up his sleeve. He probably has three albums worth of stuff recorded. "The stuff I've heard. I've been up in his hotel room many nights and he just sits down at the piano and plays. I'm like 'this is amazing, people have to hear this song' and he's like "ah, this is something I'm tinkering on'." The musician went on to praise the singer as a musical "genius" with a "rare" gift for songwriting. He added: "He's just a genius when it comes down to music and I just cannot wait to sit down with an acoustic guitar and just write. He's just got this gift that's very, very rare." Axl and his band of hired hands play bombastic metal classics of the calibre of 'Welcome to the Jungle', 'November Rain' and 'Paradise City'.